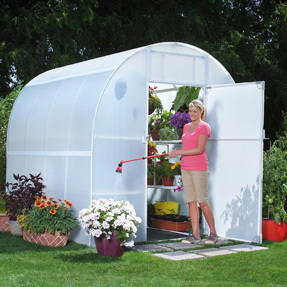 Home/Greenhouses/Hobby Greenhouses/Riga Garden Greenhouse Kit - 7'8" x 7' x 6'11"
Gothic shape helps shed off the snow! Dreaming of organic vegetables, fresh cut flowers, and tomatoes in middle of the winter? How about a flowering garden year round? 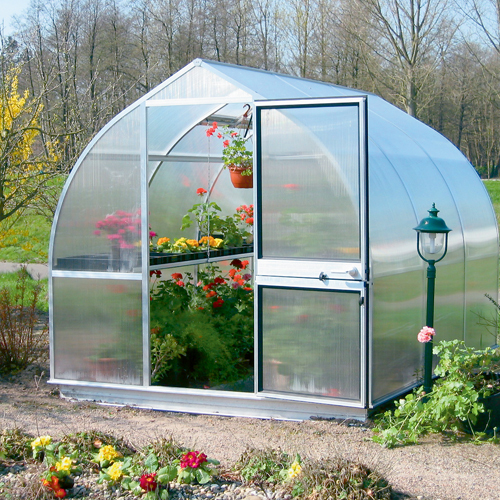 It is all possible with a Riga greenhouse! The beautiful Riga Greenhouse, with it's 8mm polycarbonate over the main body, helps cut out direct sun and insulate your plants from frost. The 10mm polycarbonate on the front and back end-walls make for a strong and secure greenhouse, able to last for years! Dutch-doors and large vents help bring fresh air through the greenhouse. The roomy design, measuring 7'8"W x 7'L x 6'11"H, includes dutch-doors and provides plenty of space for both grower and plants. A large manual back vent and roof vent(s) help bring fresh air through the greenhouse. Open the sturdy dutch door for even more air flow! FREE SHIPPING in the contiguous 48 states! Hanging Rods: No. Optional hooks available. Easy of Assembly: Moderate. Allow a weekend and 2 people to assemble. How do I prepare my greenhouse site? How long do the greenhouses take to assemble? Do you need more than one person? It usually takes 2 or more people 2 days for construction. What tools are needed to assemble the greenhouse? A few sockets and screw drivers. How do the greenhouses hold up in the wind and snow? If anchored, the greenhouses hold up exceptionally well. Can the greenhouse be extended (made longer) at a later time? 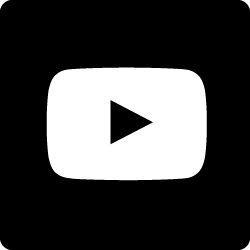 Frame and roof beams are of one piece for strength and cannot be lengthened. Is the greenhouse portable? Can it be disassembled if I move? Yes, each year the greenhouses are exhibited at national trade shows and disassembled to show again. Can an exhaust fan be installed? The polycarbonate can be cut with a hacksaw, but customer would have to retrofit the fan to fit in the frame and seal it.